A talented model we came to know in our ethnographic research and social documentary work decided to help make our first splash cover page. She can be contacted through Instagram @muetika107. SInce our agency focuses on the idea of the icon as a key, organizational concept, we wanted to create a first impression that was truly iconic without feeling too deliberate and obvious about it. Since we wanted to invoke the original idea of the religious icon as it found expression (and became a focus of debate) in early Christian theology, the visual motif of circles around the head was a tempting visual motif to play with, and harkens back to the iconography of Byzantine art, which denoted divinity by drawing obvious halos around the subjects' heads. These early icons were generally religious figures such as Jesus, Mary, or the Disciples, and we found inspiration in this historically significant iconography of early Christianity, which had to come to terms with depicting holy figures as icons. Before long, Christianity had come to terms with the burden of holy icons against the commandment to not "worship graven images" by reasoning that there was nothing sacrilegious about worshipping the human forms divinity had taken and depicting them to allow themselves as easier conduits of faith and demonstrations of piety. In the end, they were not worshipping the icons themselves, it was reasoned, but the representation of a worldly manifestation of the divine. It was an expression of faith to the truly divine Father, Son, and Holy Spirit, albeit through representations of representations, a drawn avatar of a worldly human form that was itself a mere vessel for the divine. That was ancient history. Nowadays, we have a new kind of modern icon, enabled by mass media and the commercial art of film, magazines, and radio in modernity's early years, and similarly enabled by the Internet, Facebook, and Instagram today. And the most iconic icon of the modern world was surely Marilyn Monroe. Few would disagree with calling Marilyn Monroe an icon, although many have forgotten the true origins of the word and concept. Andy Warhol, however, most certainly did not. For the purposes of our splash picture on the site, we wanted to harken back to the original idea of the icon by utilizing its modern manifestations. Both Marilyn Monroe and Madonna are the most iconic icons, since their fame and social relevance is clear even to people who did not live in their times. And since these particularly influential icons all happened to be American and look somewhat alike (not to mention being likely the two most influential women in American mass popular culture in the 20th century, they seemed to be a logical, visual overlap. In short, we just thought overlapping and reinforcing levels of iconic would get the point across. Along with a circular light, blonde hair, and a top hat. In order to be truly iconic yet without trying to be too specific, we hoped to invoke feelings of iconicity without actually suggesting we were impersonating someone in particular, even if that particular someone was exactly who you were thinking of because of the image. 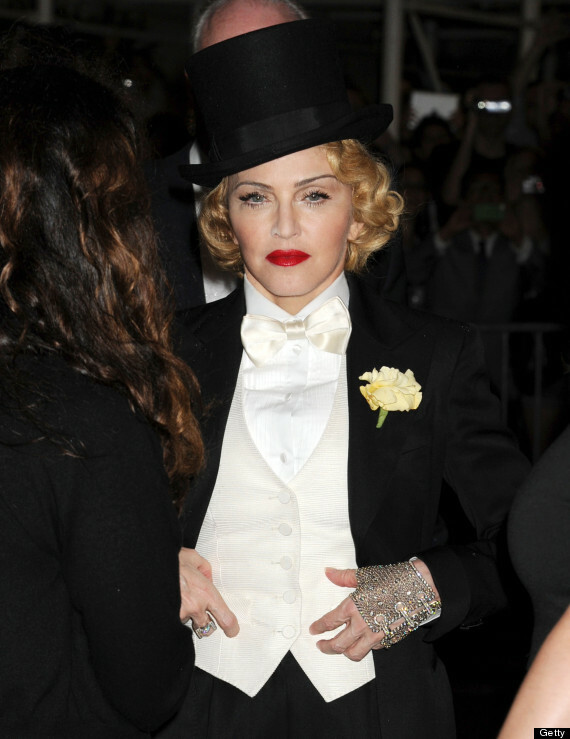 We wanted the icon to be Madonna-like without you thinking, "Oh, they're doing Madonna." Think we pulled it off? Whether you did or not, we plan to have a new "Object of Iconicity" on our site's splash page each month to continue the theme and obviously, continue the fun.